There are 2 reviews so far. To add a review of your own for this item, visit the voting page. Probably many fans will be acquiring this book/dvd set mainly for the early treat of the Tenth Planet, like I did. For this reason alone this set is to be commended. The restoration of this story is in the BBCs usual excellent high standard. The animated episode four those is an unequivocal delight. All the likenesses are there for everyone, but its the brilliant recreation of the Mondas giants that truly grabs the attention. This episode, you can tell, has been lovingly done. There is no fault with this brilliant episode, and it is a must have for any person who calls themselves a fan of the great Doctor. And William Hartnell is clearly unwell, but still manages such a magnificent performance as the great Doctor. He was the man who brought this character to life. 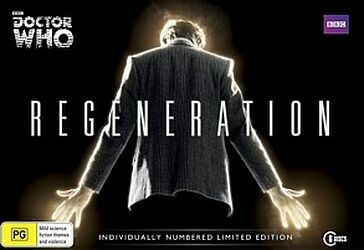 And his regeneration scene frankly to me is still the best of all of them. One cant see where he goes and Pat Troughton comes in. The other stories may well all have been previously released, but there are some great stories in amoungst these. There is the epic The War Games, Pat Troughton's brilliant swansong, in which I believe this fine actor was at his all time best with the exception of his later re-appearance in the Two Doctors with Colin Baker. Theres not many shows that can run for four hours and keep the interest and fast pace that the War Games manages with consummate ease. This is another extremely enjoyable story that has always been one of my top Who tales. There is so much revealed in this story, and so many excellent ideas. Planet of the Spiders may well not have the best regeneration scene, but it certainly has some classy moments all along the way. Jon Pertwee goes out with one of the most touching regeneration scenes I think. He bows out in amazing style. And Elisabeth Sladen and Nicholas Courtney off course are and will always be fondly remembered for their brilliant roles both now and back then when this story was first put together. Logopolis as well sees a tremendous bow out for that most recognizable of Doctors, all tooth and curls Tom Baker. Tom had a lot to live up to, being that he was not quite as well known when he took over the role of the Doctor as the previous actors. But boy, he did not disappoint. His tenure boasted so much, so many iconic villians, so many lush scripts and stories and settings. And Logopolis adds a fitting end to 7 extremely impressive years as the Doctor. Tom Baker had some brilliant out of this worldness to him. And the harder science base to this story is also different and engaging. And the regeneration scene is awesomely done. The Caves of Androzani has often bee cited as one of the all time greats of Doctor Who. And its not hard to see why. There is a level of acting in this serial that even every modern actor would be hard pressed to beat. For a start, peter Davison really gives all his oomph into the role of the Doctor, even though the Doctor isn't actually the centre of the story. But his scenes are immediately attention grabbing. Then we have the supremely excellent Chris Gable as Sharaz Jek. A very good multi-layered character who gets a really decent level of development along the way. Morgus and Salateen and Chellak and Stotz are all portrayals of the worst kinds of villain. Time and The Rani has always been so badly maligned. But aside from the flimsy regeneration, which could not be avoided due to the shocking treatment of Colin Baker in the role of the Doctor. But this slight wobbly start gives way to me what is a real firm and stolid start to the Seventh Doctor. Sylvester immediately grabs the role with both hands and makes himself noticed. And Kate O'Mara is awesome as the time lady villainess the Rani. And the other effects in this story are of a very strong kind. The spinning spheres of the Rani's traps particularly are of note. And Bonnie Langford is not half as bad as Mel as she's frequently accused of being. She's a real marvel actually in my view. Paul McGann should have been given a series. Glad Big Finish have had the sense to give him such brilliant chances in the audio series. But desite many of the elements of the Movie being rather weak in my book, Paul is immediately the Doctor. He has a great presence that makes him just as good as any before or after him. And his chemistry with Daphne Ashbrook is clear to see, and they do rise the movie from being totally rather a wash out. And Ric Roberts definitely deserves plaudits for the role of the Master. We at last get a Master who is really nasty and slimy. Just the rest of the storyline is a little forgettable in my view. But Paul certainly is impressive, and still is an amazing Doctor. What I wouldn't give to see him back in the new series some time.